Well. It has been a big week for pets here in Stimeyland. Some good, some bad. 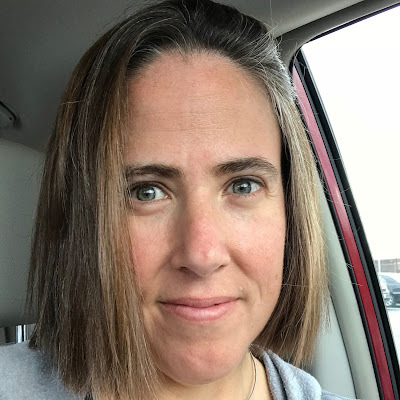 I figured I’d wrap some stuff up here before I wander off to other topics, because much as I would love to talk about all gerbils all the time, I imagine some of you are not as excited about the whole thing as I am. First though, Cassidy. Thank you all so much for your nice comments and emails and and messages. Every single one of them meant a great deal to me and my family. Saturday went as well as could be expected, but it was still terrible. Of course. 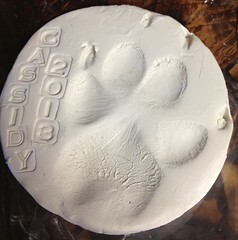 The vet and vet tech made an imprint of her paw after they took her away and the vet tech brought it back to our house. It was such a tremendous act of kindness. I keep expecting to see her wandering around or stealing food off of our table. It’s also hard to break habits like closing doors to rooms that I don’t want her in or hiding trash cans from her. It’s definitely quieter around here without the constant jingling of her collar tags. That dog. She was such a problem. But so good. The kids are doing well. We’re talking about her and making sure they know they’re allowed to be sad. I wrote about her for White Knuckle Parenting this week. I included many of the book suggestions you gave me, but couldn’t include them all. Thank you for all of them regardless. So. How are the gerblets doing? There are still five of them. Today their ears popped open. It hadn’t even occurred to me that they didn’t have ears until suddenly they had them. I’m supposed to start handling them in the next few days so they get used to people. I imagine that Jetpack and Mouse will have some menacing glares to give me when I pick up their babies. I’m basing this prediction on Jetpack’s reaction to my taking a photo of the babies from the outside of the tank. All five of them, eared and naked. 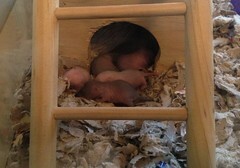 You may notice that the gerbil babies are different colors now. I can’t tell if they have very short fur buzz cuts or if their skin is changing colors. Regardless, I’m hopeful that this means I won’t end up with five identical off-white gerbils, in which case I would just name them all George Foreman and be done with it. This whole baby thing is honestly one of the most amazing things I’ve ever watched—and listened to. They squeak all of the time. Frankly, the only negative about the whole thing is the stress of the possibility of 8500 more baby gerbils. Otherwise, watching their development is fantastic. My kids are super into it as well. Quinn had a friend over this afternoon and when his mom came to pick him up, Quinn handed her a photo of the baby gerbils to take home. If he knew what cigars were, he’d be handing them out too. Now. I know everyone is VERY concerned about the gender of the gerbils. 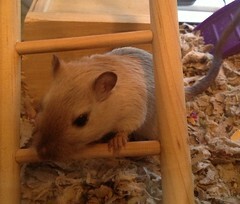 I’m happy to report that I think I’ve figured out which gerbil is the mom. I think Jetpack is the mom. I know. A twist! No one saw that coming. Today all seven of them were packed into this tiny hut they have and Mouse was on the bottom of the gerbil pile on his stomach. Jetpack was on top of him on her side and it looked like a baby was nursing from her. I turned a flashlight on them and everything to try to be sure. With the tangle of limbs and the darkness and the tiny hut opening combined with the nearly identical fur coverings and the fact that no faces were visible, it was still hard to tell who was who and what was happening, so I’m only about 95% sure that Jetpack is the mom. But really, if I’m wrong, what’s the worst that could happen?